An enchanting storybook cottage that's just steps to the beach - Welcome to Quincy Cottage. 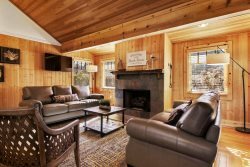 One of the original cottages in Cannon Beach, built in 1915, the owners of Quincy Cottage have maintained all of its original charm while adding all the amenities that will make your vacation comfortable. Stepping through the trellised front gate and up the cobble-stoned path to the front porch, you'll feel as though you've left your day-to-day life behind and entered a slower, more relaxed, simpler style of life. From the beautiful landscaping to the vintage Americana style of decorating, you are in for a treat. When you walk in the front door you're immediately drawn into the dining and living room. With a large table perfect for family gatherings, a fireplace that's perfect for slightly chilly evenings, and all the special touches that make this home unique, there's something to see in every corner. From the bar set-up to old photographs, there's something of interest everywhere - and don't miss the framed original blue print of the house from the Portland Railway Light and Power Company. The kitchen has its own vintage charm. From the checkerboard floor to the antique cupboards and the ice box style modern refrigerator, it's the perfect spot for a quick breakfast before heading out to explore the beach or the shops downtown. The main floor bedroom has a quiet serene feel with its crisp white furniture and comfortable queen bed. Just next door is the main bathroom, complete with a claw foot tub. The laundry room finishes out the rooms on this level. Upstairs are two bedrooms and a unique little nook, just perfect for someone looking for a quiet spot to finish a good book. The first bedroom has two twin beds and the second has one queen bed. Both bedrooms are long on style and comfort, and sleeping in is a definite possibility. Just a couple of steps from the main house is the garage that has been completely renovated. There are two bedrooms and another bath here. This fourth bedroom is a bunk room with four bunks and lots of great features. Between the two sets of built in bunks is a cupboard/shelf filled with books and each bunk has it's own individual light so story time is set. The fifth bedroom has a queen bed and is again another calm oasis. From the old novelty signs to classic chandeliers, from rotary phones to American flag embellishments, this clean, well-kept home will spirit you away instantly to another, simpler era when visits to the beach were all about unwinding in a fresh breezy seashore landscape. Quincy Cottage offers vacationers a taste of Americana at its coastal finest. There are many new amenities at Quincy Cottage, which we enjoyed, including a new gas stove. However, we could not figure out how to turn on the oven. Staff went above and beyond in tracking down an owner's manual that provided the answer. Much appreciated! We love Quincy Cottage, and are disappointed we won't be able to stay there again next summer. Only one week works for us in 2019, and the property is already booked then. Loved this charming house and location. Well equipped and maintained. We loved Quincy House. The location is prime, amenities, perfect! The house is adorable, everything is beautifully decorated. Especially enjoyed the fire place. Didnt bother us one bit that it rained a majority of our stay, we were cozy and warm in our quintessential cottage. Cant wait to return! It was really wonderful. The only thing that did not work was the televisions in the kitchen and upstairs bedroom. Wasn't a big deal, so we did not call. We loved the Quincy Cottage and will definitely return!! Excellent people to work with, extremely friendly and helpful. Quincy Cottage is a wonderful place to stay. I appreciated how your staff came out to see what was going on with the alarm in our unit, and then sent the alarm company out to take a look. They turned the alarm off for our stay saying they would figure out what had happened after we had checked out so as impact us the least. I also appreciated that staff called me before leaving for the day to follow up and make sure that all had turned out right. We had a lovely time in this picturesque cottage house. It was a great location and comfortable with lots of nice touches that show that the home is well loved, not just another rental. Internet died. Staff came in 15 minutes and fixed promptly. Sweet place. We loved being able to walk everywhere. The property was very conveniently located. The ability to have garage parking was really nice!!!!! !